NVTBL and the Premier Showcase League (PSL) have announced two can’t miss events this off-season for high school players striving to play college baseball. 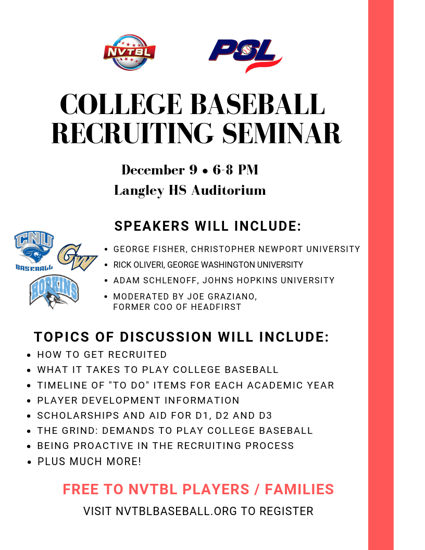 NVTBL will host their annual college baseball recruiting seminar on Dec. 9 from 6-8 p.m. at the Langley High School auditorium. The seminar will feature coaches George Fisher from Christopher Newport University, Rick Oliveri from George Washington University and Adam Schlenoff from Johns Hopkins University along with moderator Joe Graziano, former COO at Headfirst. The panel will discuss different ways to get recruited, what it takes to play college baseball, scholarship information, insights into the recruiting process and much more. The seminar is free to all players and families. For more information on the event or to register, please visit our page here. On Jan. 27, NVTBL will kick-off the new year by hosting a showcase event from 2-7 p.m. at The St. James in Springfield. Over 25 college coaches from Division II, III and JUCO programs will be in attendance to watch players showcase offense, defense and pitching. Players will also be timed on the 60-yard dash and shuttle run, measured for vertical and broad jumps and have arm and exit velocities captured. Players will have the option to register as a pitcher, position player or both. The event is for 2019, 2020 and 2021 graduates only. For more information on the showcase event, The St. James or to register, please visit our page here. Don’t miss out on these local opportunities to gain knowledge on the college baseball recruiting process and showcase your talents in front of college coaches. DEC. 9 - College Baseball Recruiting Seminar: 6-8 PM at Langley HS Auditorium. 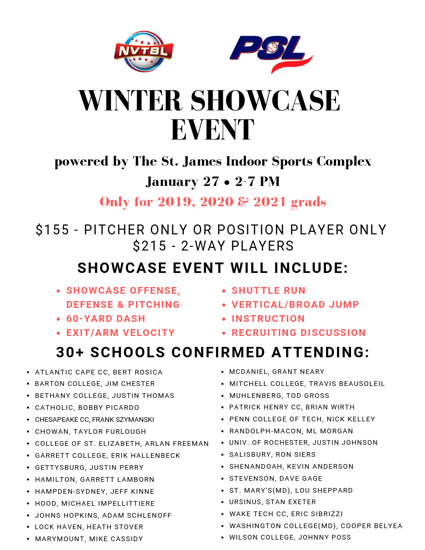 JAN. 27 - Winter Showcase Event: 2-7 PM at The St. James in Springfield, VA.
©2019 Northern Virginia Travel Baseball League / SportsEngine. All Rights Reserved.